Volkswagen will pay owners of its polluting diesel cars in the U.S. up to $7,000, and agree to fund a grant program to offset air pollution, under a $10 billion settlement being negotiated for submission to a federal judge next week, people familiar with the talks said. VW will provide cash payments worth between $1,000 and $7,000, depending on the vehicle’s age and other factors, to compensate consumers, the people said. All spoke on the condition they not be identified because U.S. District Judge Charles Breyer, who is supervising the settlement discussions, has imposed a gag order. The environmental remediation program is a key priority for regulators looking to undo the damage of 482,000 diesel cars that emit up to 40 times the permitted amounts of smog-forming nitrogen oxides. VW isn’t expected to be able to repair all of the cars affected to the satisfaction of the EPA, which may result in buybacks or extra payments to the environmental fund. The company has admitted that since 2009 it rigged cars to pass EPA and California Air Resources Board emission tests. 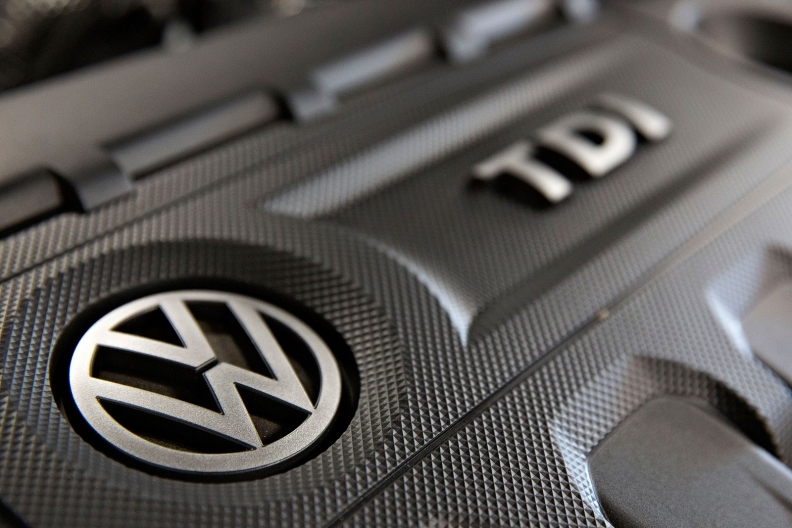 VW, the EPA, CARB and the Justice Department, and attorneys representing affected consumers are scheduled to present a settlement agreement June 28. The parties reached a tentative agreement in April though discussions on the details are still continuing and may change before being submitted, the people said. Jeannine Ginivan, a spokeswoman for Volkswagen, and Nick Conger, a spokesman for the EPA, declined to comment. Regulators are looking at a small but popular diesel-emissions clean-up program as a model for a VW remediation fund, according to the people. The Diesel Emissions Reduction Act grant program is funded by the EPA but partially administered by states with severe diesel pollution. The so-called DERA program funded projects like retrofitting older diesel buses or scrapping and replacing fleets of diesel-powered drayage trucks at ports. The cost of the settlement will exceed $10 billion, a person familiar with the matter said. The deal is expected to include penalties for breaking U.S. clean-air laws, money to buy back vehicles, to compensate consumers and to settle class-action claims. The company also faces a Federal Trade Commission action for false advertising. Lawyers for car owners are due to submit the proposed deal to the San Francisco federal judge overseeing U.S. lawsuits by June 28. The settlement will include options for car owners to sell their vehicles back to Volkswagen or to terminate their leases early.